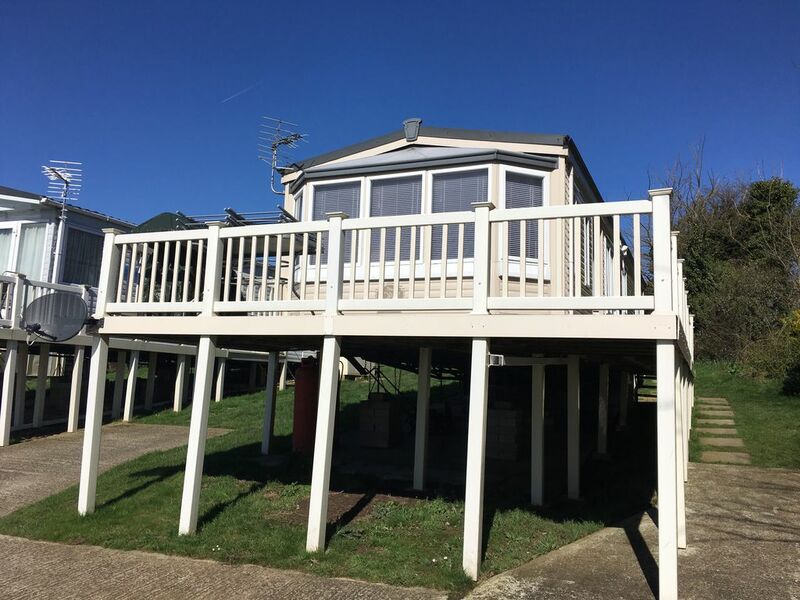 Situated on a family park, it has fabulous views of the Kent coast, in a panoramic location on the Isle of Sheppey. Surrounded by woodlands, countryside and spectacular sea views. Accommodation for families of upto 6 as well as accommodating couples, we do our best to make sure your stay is special, whether its a Family Holiday, an Anniversary Getaway, A Birthday treat, or possibly somewhere to stay on a work assignment, we can accommodate everyone. SUMMER SEASON - we have added furniture for your use outside should you wish to eat and drink on a warm summer evening enjoy a sunset maybe with a glass of wine. We want your stay to be as pleasurable and relaxed as possible and as we are local to the van, we can be on hand to deal with any queries you may have during your stay. The static caravan is a three to four minute walk from the main clubhouse complex but is still in a quiet location prime position on the Park. To the front of the caravan is a well proportioned open plan lounge with seating area with pull out sofa bed, tv unit, display coffee table and electric fire. Adjacent is the kitchen/dining area with freestanding table and chairs. The kitchen has a gas hob with overhead extractor, gas oven, grill and fridge freezer, as well as storage cupboards, and shelves also with microwave, toaster, kettle, there is ample crockery, cutlery, saucepans, bowls, dishes, utensils, glasses for your use during your stay. The sleeping accommodation comprises of Main bedroom with white wooden double bed and memory foam mattress, the room also has two wardrobes, a shelving wardrobe and shoe storage, as well as a vanity desk, there is also a USB plug socket for your convenience there is an en- suite that leads off the main bedroom, this consists of a shower, toilet and wash basin (also accessible from the hallway). also with an electric heater. The second bedroom consists of two single beds, a tall chest of drawers and extra storage unit , Shelf and also TV for your use, this also has a USB plug point for your convenience. Both bedrooms have electric heaters installed. In addition there is a further separate wc and handbasin in the caravan for convenience all round! The bathrooms have blinds for extra privacy. In the Living Room area you will find a double pull out sofa bed so that a total of 6 people could sleep in the caravan (please advise us if you intend to use this so that we can provide additional linen). A cosy electric fire is installed in case the evenings get chilly as well as a thermostatic electric heater freestanding and also another wall mounted thermostatic heater in the main kitchen area too. There is a television in living room and both of the bedrooms, please note the ones in bedrooms have dvd players too and we supply a selection of dvds also for your use. Max Occupancy: 6. Children welcome. Facilities include an outdoor heated swimming pool, open from May to September. A children’s play area, multi sports court and large football field. Clubhouse with arcade, entertainment for all the family, homemade food, drinks, and a small convenience kiosk selling sweets and toys and those items that we all forget to pack. A £50.00 non-refundable deposit is required at the time of booking to secure your dates as well as £50.00 Damage Security Deposit or £75 if two weeks or more which is refunded within three working days of departure if everything is found to be in order and no damages etc are found. Balances are to be paid 28 days before your arrival. PLEASE NOTE we operate a strict non smoking policy in our caravan. Caravans must be kept in a clean and tidy condition and all damage/breakages must be paid for. We were welcomed at the property by TJ. The accommodation was spotless on arrival. A real home from home experience. Welcome hamper was a real treat and very much appreciated. Lovely soft and comfy furnishings. So warm and comfortable. So relaxing just what I had in mind when booking. Lovely sea views right beside the property. Clean safe and tidy holiday park. I would highly recommend. We will definitely be returning in the future. Thank you so much TJ for making us all feel so welcome you definitely have a personal touch. Thank you so much Lindsay for your wonderful review. It has made us very happy to know you all enjoyed everything about your stay and that everything met yr expectations and more. Our role is always to make sure each and everyone of our guests enjoys every minute of their stay. Thank you so much Steven it was a pleasure having you all. We are so happy you enjoyed your stay with us and we look forward to seeing you all again. We always do our best to make our guests feel welcome and to make their stay enjoyable as we can. Thank you for your kind compliments. Tracy and Warren are fantastic hosts! Nothing was too much trouble even when our circumstances changed last minute they made sure my family was cared for. I can't thank you enough for taking the weight of my shoulders. Every step even before arrival was spot on ensuring we knew how to get to the caravan and what we needed to bring. I was hoping for a lovely quiet stay for just me and my dog, and I wasn't disappointed! A beautiful caravan with everything that I could possibly need in a fabulous position, close to wonderful views of the sea. A warm welcome from the owner and a beautiful welcome hamper made the start of my break very special. The caravan is modern, very well equipped and very warm and comfortable. There was a selection of DVDs to watch in the evening and a TV in the master bedroom which was a treat. Everything was spotlessly clean. I highly recommend this caravan and the kind and welcoming owner. Very confortable and lovely. We stayed 4 nights, beautiful, clean and sea view. Perfect place we loved.